While no personal injury claim is simple, some cases are far more complex than others. Due to this, it is often hard to quantify what a plaintiff should expect in terms of a monetary settlement or payment. In fact, there are times when payment at large is not guaranteed, even when the defendant is found to be at-fault. When a defendant does not have the means to pay a debt decided by a jury in a personal injury case, there is no way to force them to come up with the money. This means it is important for the plaintiff and their personal injury lawyer to consider how much a defendant is worth, and also the potential policy limits from an insurance company, before answering a settlement offer. When it comes to a personal injury, damages can mean a plethora of things, ranging from medical costs to financial losses to lost wages. It can also include emotional pain and suffering, along with compensation for physical pain. In the case when the defendant was negligence in action, the settlement might also include punitive damages. Due to the wide array of potential damages, a settlement can be very large or quite small, depending upon the unique details of the case. For instance, injuries from a slip and fall accident can range from a person slipping on ice in front of a building and suffering a spinal cord injury, to a shopper in a store twisting an ankle from slipping on a wet floor. The person with the spinal cord injury will more than likely receive a much higher payout considering the depth of their injury and because the property owner was likely negligent in their duties to properly clear walkways. The shopper will likely receive much less as the injury is mild, even if there was no signage to warn shoppers of the wet floor. Determining whether the defendant is liable or not is a major factor in any personal injury case. Even when the damages could result in a large payout, if there is little to no evidence that the person was negligent or had liability in the accident, it is unlikely anything will be paid. Using the same example as above, it is easier to prove liability with the wet floor in the store, as it is clearly the store at fault as they own the property and have a duty of care to customers. However, the person who slipped in front of the building has the job of proving who should have cleared the walkway, and that there was ample time to do so. Due to this, the person that slipped in the store might wind up with more sizeable settlement. At LeViness, Tolzman & Hamilton, we have extensive experience representing Maryland residents injured in all types of accidents including car accidents, dog bite accidents, motorcycle accidents, slip and fall accidents, truck accidents and in wrongful death claims. 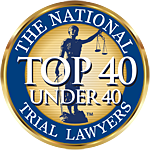 We have secured over $100 million in verdicts and settlements for our clients over the last 25 years. No matter what the circumstances are surrounding your injury, you deserve legal representation that will fight for what you are owed. Glen Burnie personal injury lawyers at LeViness, Tolzman & Hamilton can be reached 24 hours a day at 800-547-4LAW (4529) or you can contact us online. Our offices are located in Glen Burnie, Maryland where we represent injured victims and their families throughout Baltimore City and Baltimore County, including those in Anne Arundel County, Carroll County, Harford County, Howard County, Montgomery County, Maryland’s Western Counties, Southern Maryland and the Eastern Shore, as well as the communities of Catonsville, Essex, Halethorpe, Middle River, Rosedale, Gwynn Oak, Towson, Brooklandville, Dundalk, Glen Burnie, Pikesville, Parkville, Nottingham, Windsor Mill, Lutherville, Timonium, Sparrows Point, Ridgewood, and Elkridge.